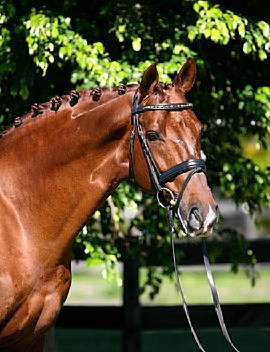 Wild Dance is a 16.2 hh Hanoverian, also approved for the Oldenburg, Hessian, Westfalen and Rhinelander verbands. Winner of the 100-day stallion testing in Germany with over 140 points! Over 147 points in dressage/ridability. Although he is a fantastic mover, he also received a 9 on jumping. Wild Dance is by one of the best Weltmeyer sons, Wolkenstein II, out of a States Premium mare by Matcho AA. This bloodline combination has proven exceptional. 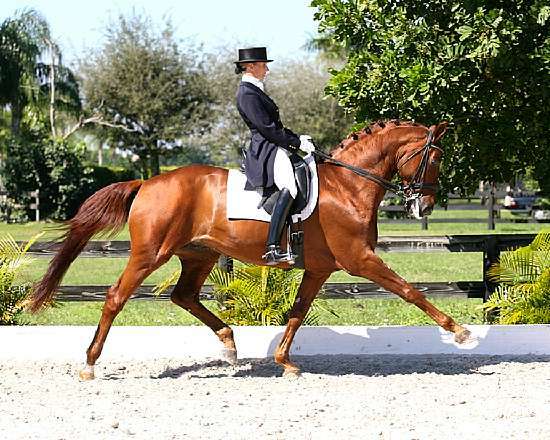 He is a good candidate to refine heavier warmblood mares and add movement and suspension to the gaits. Wild Dance is nothing short of breathtaking. With elastic movement, natural balance and self-carriage, he is a dream. He placed fourth in the German National Championship as a young horse. His father, Wolkenstein II, was also the winner of his stallion performance testing and went on to sire 41 licensed sons. Wild Dance who placed fourth in the Bundeschampionat as a youngster, has an impressive FEI show record. 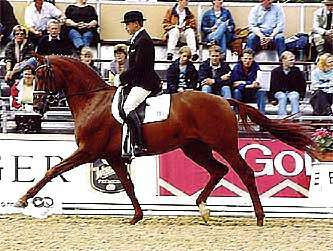 In 2005, with Hubertus Schmidt, he was the Reserve Champion at the 2005 Neurenberger BurgPokal Finals, a prestigious show circuit in Germany for seven to nine year dressage horses competing at Prix St. Georges. Wild Dance and rider Hubertus Schmidt had the highest qualifying scores, routinely scoring above 75%. Wild Dance did not keep a heavy breeding schedule, however, his offspring statistics are spectacular; of the only 24 foals registered as show horses, 10 had successes in the 2010 season. 3 were already successfully placing at S-level in 2010, a very high percentage by registered offspring. Wild Dance has produced several State Premium mares. In the US he bred only a handful of mares but produced the top scoring premium colt nationwide for Oldenburg NA.